Albert King is an Action-Based Learning Facilitator and Personal Development Coach delivering programs to organisations on Teamwork, Leadership, Communications and Goals Setting. He is a member of the Association of Experiential Education, a certified Leave No Trace Trainer, a CA of the Institute of Chartered Accountants of New Zealand and holds a Bachelors of Commerce & Administration Degree in Accountancy from Victoria University of Wellington. 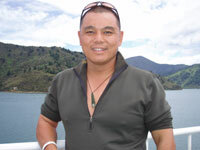 A New Zealander, Albert has over 15 years of finance and business experience having lived and worked in New Zealand, Australia, United Kingdom and South East Asia. He has held various positions as Group Financial Controller with MNCs, Experiential Training, Public Relations and IT companies. Some of his milestones include pioneering the establishment in 2000 of the Lions Club of Singapore CyberCare, a non-profit organisation which is dedicated towards assisting and training under-privileged children to use technology in their daily lives and helps build their confidence and communication skills. In 2003, he spearheaded the CyberCare Leadership Service Learning Mt Everest Expedition which sponsored under-privileged children from Singapore, Malaysia and Nepal to trek the foothills of Mt Everest. The expedition donated Educational resources, Computer Laptops, Medical supplies and built a school library in Nepal. Albert's personal interests include trekking, swimming, mountain biking, and community service. He is a volunteer with Make-A-Wish Foundation and Habitat for Humanity.